Welcome to the first in an occasional series of pages, which will allow visitors a closer look at some of the more interesting Subbuteo products. Items on my normal accessory list are kept down to a brief description and a couple of pictures, so the download times stay acceptable to those of us who are stuck with slow modems. However, some sets would benefit from a more detailed examination. This first "Focus on..." would not be possible without the assistance of Pierre Chastenais, who owns the set displayed here, and also took all the fine photos used. As with other photos on the site, I've reluctantly had to cut down Pierre's originals to keep the page to an acceptable size. My server doesn't really like photo galleries. 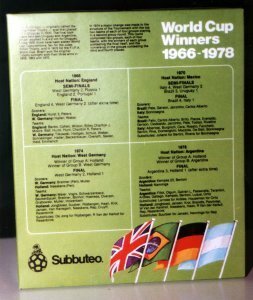 The World Cup Winners pack only appears in the 1980 catalogue, and I can't imagine that very many were sold at that time or it would have lasted longer. A number of unsold shrink-wrapped versions were sold by an ex-Waddingtons employee a few years ago, and this set is one of those mint versions. The pack consists of a wrap surrounding four boxed teams, representing what was then the last four winners of the World Cup in their cup winning outfits. The pack is interesting to me because it comes from a period when Subbuteo was in transition. The company had moved up the road from Tunbridge Wells to Tonbridge, and the next few years would see further moves to Tyne and Wear, and then on to Leeds. The boxes, figure types, and painting techniques all changed in the space of a few short years. In this set we have the various changes illustrated very graphically. The Subbuteo Crest showing the head of a hobby (Subbuteo is the Latin name of this bird) has replaced the old kicking footballer logo. The individual boxes are the late 1970 variation showing one player in a window. These boxes usually have heavyweights (hand painted), or zombie figures (usually machine painted - but not always). However, here the brand new lightweight figure is used. These figures arrived with a fanfare in the 1981 catalogue, but had been test marketed before that. This 1980 set is obviously one of the items used to try the new players out. 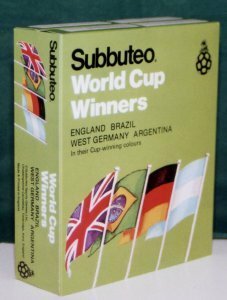 I imagine that this was a prestigious set, and it shows how confident Subbuteo Games Ltd were with the new lightweight. Imagine buying this set in 1980 expecting Zombies, and finding a completely new, improved figure! In addition to this change, two of the teams are hand-painted and two machine painted. I'm not sure why the set only lasted a year. There are a number of very short-lived accessories in this era, and they might have simply proved unpopular. However, it's possible that it is just something to do with the box and address changes. All the boxes have to change every time the address does, and this often coincides with the removal of items from the range. The address changed to Tyne and Wear in 1981. The wrap contains four standard boxes from the late 1970s, but the stickers on the ends of the boxes are unique to this set. These have team names on them with "World Cup Winners", rather than the usual team chart number. England played in their famous red away kit when they won the World Cup in 1966, and this is the only appearance of that strip in Subbuteo as far as I'm aware (you could order the "home" kit direct from Subbuteo in 1966, but not this one). That said, the kit is just red shirts, white shorts and red socks, which is identical to number one in the standard range. However, as you can see from the photos, this seems to be a slightly different tone of red to the usual kits. This is a hand-painted team, and this gives the thickness and richness of colour that the normal machine painted lightweights don't have. For both these reasons, the team really does recall the colour footage of Bobby Moore with the Jules Rimet Trophy. Also, note that the Gordon Banks figure is wearing the classic yellow/black combination of England goalkeepers. 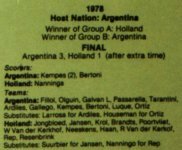 The back of the wrap shows the four finals in question, with the results, goalscorers, and names of the players. This final is the most famous England performance of all time, and we've been reliving it for over thirty years. 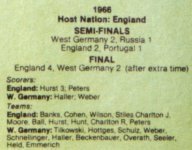 It was three years before I was born, but I could probably still name the England team for the final (so can you if you squint at the picture to the left.). A World Cup winners set wouldn't be complete without a Brazilian team. This is the team that completed the hat-trick of wins which enabled Brazil to keep the Jules Rimet trophy. The team is a machine painted lightweight, and the colours seem to be the same combination as the classic No50 from the normal range. Shortly after this date, Brazil became No 410, which doesn't seem much different except for some extra trim on the shorts, but it might make the original Brazil more unusual in the lightweight figure. I like the deep blue jumper of the goalkeeper, and this is probably my favourite of the four teams here. The 1970 World Cup was held in Mexico, and produced some of Brazil's most memorable performances. At least within the era of colour TV pictures anyway... These goals must have been shown on English TV almost as often as the ones from 1966. Here are the West Germans from the beginning of their period of dominance in the European game. This is a hand painted lightweight figure, and is exactly the same as No 156 in the normal range - the standard West German kit throughout the 1970s. Somehow, the black hoop around the neck of these players is the perfect finishing touch. It brings back memories of those tight necked shirts of the 1970s. This year saw one of many changes to the World Cup final structure, with no semi finals - the two group winners contesting the final. 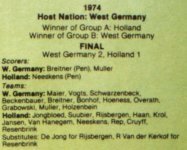 Germany hosted an all European final, and the home team saw off the classy Holland team of Cruyff and Co in the final. When the set was produced, Argentina were the current holders of the trophy, enjoying the first of their two victories. This machine painted team is, once again, the same as a classic long standing number in the normal range - No 67. Another World Cup won by the host nation in front of fanatical support. Holland were again the brave losing finalists. Will they ever get their hands on the World Cup? It just wouldn't be Subbuteo without a few oddities and alternatives now would it? I have acquired the teams from a World Cup set locally (no outer wrap sadly) and three of the teams were different to Pierre's set. My England were a disappointing machine-printed reference one, and West Germany was also a standard machine version. However, Argentina were hand painted in an interesting style. The team is illustrated here, and you can see that the players have been painted with pale flesh. The socks are different to the standard reference 67, and for those interested in Subbuteo painting styles, it is worth noting that the kit has no collar. 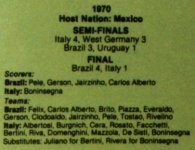 E-mails to the website suggest that this team often appears in World Cup Winners sets that were actually sold at the time (as opposed to the unsold stock as shown above).